The NEW KCWN Community Calendar! Every spring for the past several years we’ve asked you, our audience, to take part in our annual listener survey. We’ve been grateful for both the level of participation and the useful information this tool has provided; one of the things you’ve told us consistently is that you value our community calendar and you really use it! When we were working through the details of our website overhaul, making our calendar better and more useful was a big priority. We found a great solution in a third-party calendar application called Tockify - it blends seamlessly with our new SquareSpace site, while adding a bunch of great new features at the same time that we know you’re going to love! This is the default view called “Pinboard” - it’s called pinboard because it kind of looks like a cork board you might have at home, school, or office, filled with “notes” pinned to the board. You can change the calendar views via the menu on the top right corner. Next up is the Agenda view - this basically lines up the events chronologically, starting with the most recent event at the top of the screen, with successive events under the previous one. Simple! The third choice is called “Monthly” - this is the one that likely looks the most like our old WordPress calendar. Hovering over an event will make a box pop up with more details. 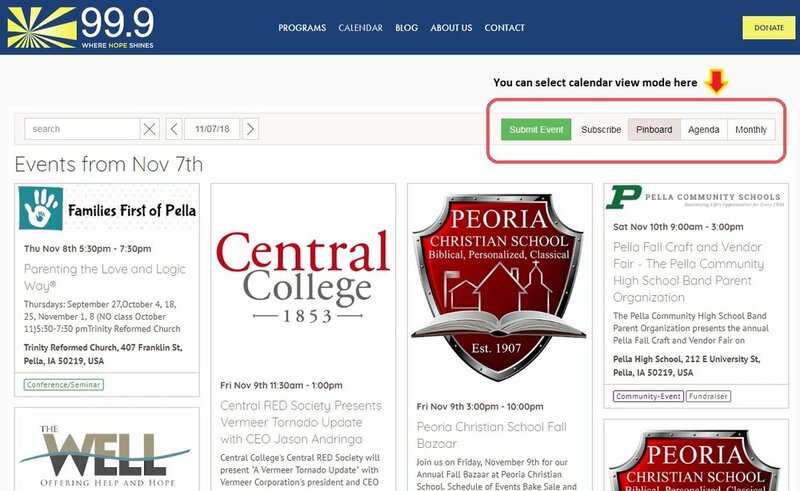 What’s new is all the different colors - with the Tockify calendar we have the ability to “tag” events with different categories, like “Fundraiser,” “Community Event,” “Kid-Friendly,” and so on. The system assigns each tag a different color - in the case of our calendar. green is “Class/Seminar,” purple is “Community Event,” blue is “Concert,” gray is “Fundraiser,” and so on. Finally, we have my favorite new feature - the ability for you, our audience, to submit events! Now, on our old website you could do this too, but it was just a simple form that we received as an e-mail. With the new Tockify system, we can now click a button to approve your events or contact you to request more information if needed. On the back end it is also much, much easier for us to add and manage events, which has made our lives much easier! So there you have it - the new KCWN community calendar! What do you think? Do you like the new calendar? Have you used any of the new calendar views or features? Are there ways you think it could be improved? We’d love to hear from you!